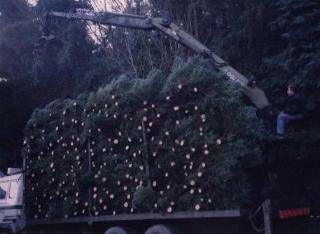 We have been growing Christmas Trees at Parkmore for over twenty years.In earlier days the trees were allowed to develop completely naturally. We now use the most up to date culturing methods entailing leader control, feeding and shearing - so producing the good quality trees that the market demands at a competitive price. ​As we have over 5,000 trees reaching maturity every year, we are very keen to establish ongoing relationships with reliable buyers who appreciate a reliable, friendly and honest service.Ideally a buyer would mark trees in Autumn and pay a deposit. On an agreed day we would cut and transport to the yard where the buyer would collect the trees - paying cash on the way out!! We have a number of independent associates who specialise in providing individual trees to customers - as required they would deliver, decorate and remove after Christmas. Our tractor mounted tree planter and sprayer are available for hire, together with personnel if required.